These questions have surfaced in multiple HOA board meetings. Managed communities send physical newsletters to their residents because it’s the one method of communication which has contact information for every property. Maintaining an email list is difficult and many neighborhood residents are not on social media platforms. Use one page with 3-4 articles if you want residents to actually read the newsletter. According to the National Center for Biotechnology Information, the average customer’s attention span is 8 seconds, down from 12 seconds in 2000 (which is slightly more than the average attention span of a gold fish). How many people do you think will read a 4 page HOA newsletter? Not many. Don’t cram your content into a single space with a 7 point font. This isn’t an Econ 101 college essay with a page limit. Use a classic serif or classic sans serif serif font (like Times Roman or Calibri), 10-12 point paragraph text, 1.15 spacing, with double spacing between paragraphs. 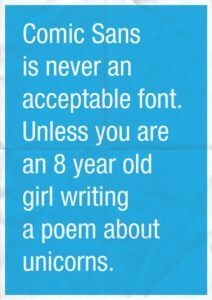 And PLEASE don’t use comic sans. More white space in your newsletter means less content, which translates to “only essential content”, which places important information front and center. Include a photo or two in your HOA newsletter. Even if it’s just a picture of your community, photos help increase engagement. A survey by HubSpot shows that 65% of respondents prefer emails newsletters that contain mostly images vs. 35% who prefer mostly text. One marketing firm shows that articles with images get 94% more total views than articles without images. Get out your camera! With online newsletters, 8 out of 10 people will read your headline, but only 2 out of 10 people will read the rest of your article. So, fit your message in the headlines. If you craft a good headline, you’ll increase the number of people that will actually read your content. Community Party on May 16 – Free Food! When are Yard Violation Letters Sent Out? Thin Mint Girl Scout Cookies – Yum! Have dates? Use a tables or bullet points to convey information quickly and easily. 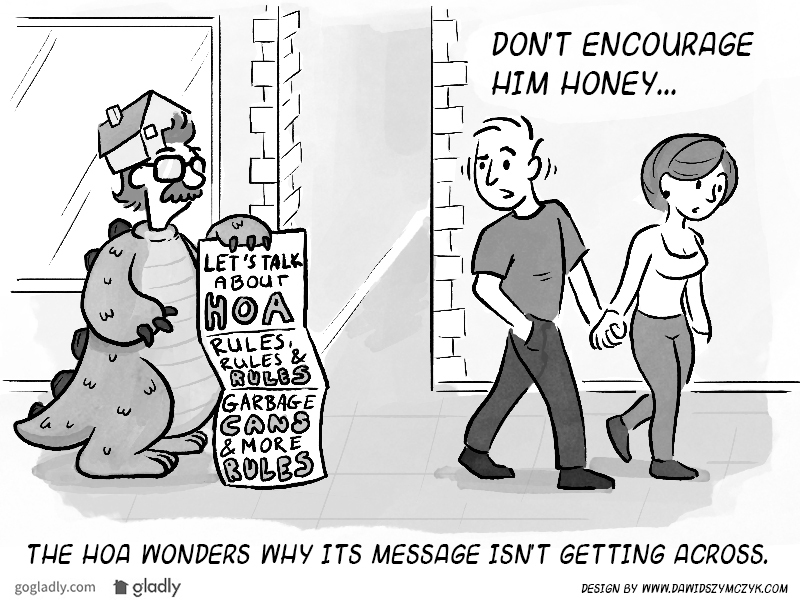 So why an HOA newsletter? 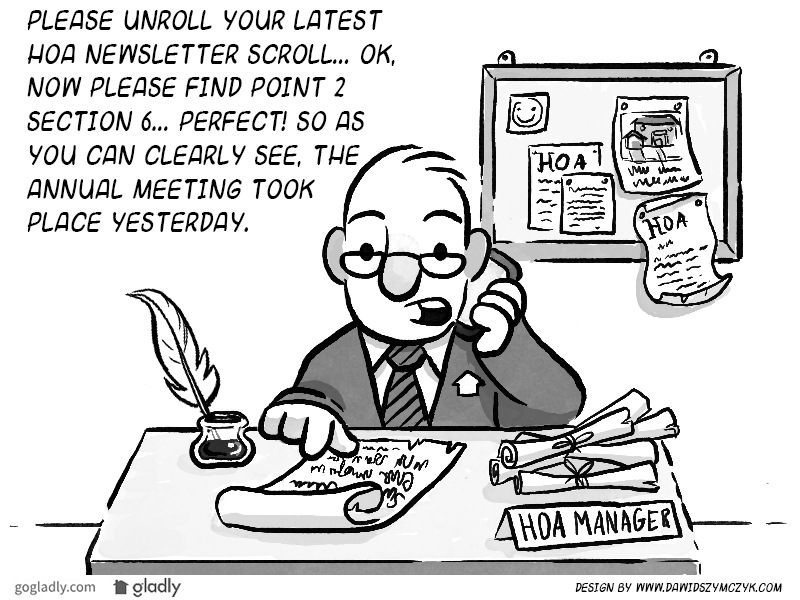 These tips will help you create a great HOA newsletter. 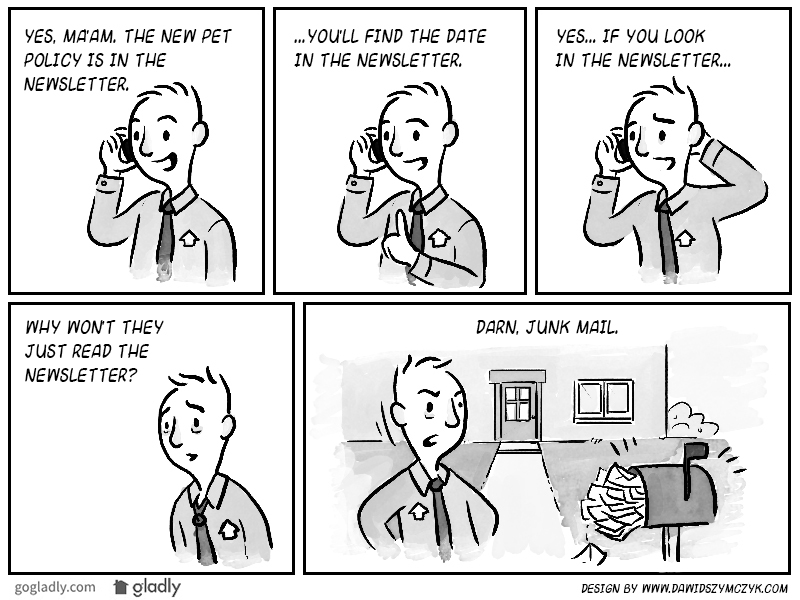 However, this brings us to the question, why do you want to use an HOA newsletter template? Outside of official communication (votes, violations, etc), newsletters are not best method of communication. At GoGladly, we found that brief electronic communication is the most efficient method. When a board member or resident posts to their community’s GoGladly message board, a short notification gets emailed to users. Gladly has over 60% read rates (way higher than normal emails) and people can respond to the message and feel engaged in their community. Moreover, with GoGladly, your contact list stays up to date because residents invite new members to participate in their GoGladly community site and or they can remove themselves they move out of the neighborhood. Click here to get the best HOA communication platform.